Well, that was nothing if not fun. The point, of course, is to introduce us to Martha Jones and get her aboard the TARDIS and so it does. 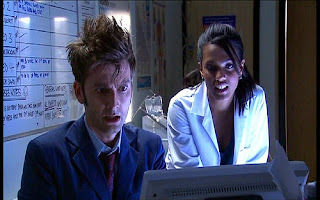 Martha Jones (Freema Agyeman) is a medical student. Not just a medical student though. Oh no. This being new Doctor Who she's a medical student with a family. A family with complications. What was it Tolstoy said: "Happy families are alike, every unhappy family is unhappy in its own way." Or to paraphrase, happy families are boring. Unhappy families. Complicated families. They're interesting. Well, if you're in a soap opera. Obviously. If you're in Doctor Who then your complicated family is a set of plot points and/or hostages to fortune. It seems a bit sudden to jump from the Tylers to the Joneses, but this is television and we must keep moving onwards. The Doctor has a couple of 'Rose' moments in this episode but he's a lot less mopey that he was in 'The Runaway Bride', which is good. He does kiss Martha. But that's just a genetic transfer and it means nothing. To the Doctor. Who clearly hasn't learned anything in 900 years. Or doesn't care. Which I hope is not the case. There's a bit of flirty banter (and a phrase I hope never to use again) at the end of the episode but Martha's hooked alas. Which might be a problem going forward. This tendency for New Who Companions to be in love - or lust - with the Doctor may or may not get irritating. We're only on the second one though so let's be generous and wait a little. Freema Agyeman does a reasonable job in her first story, which doesn't ask for a huge amount from her. She does enough to make you like her though, which is half the battle. More so in her case as Rose was - generally - a popular companion. She does a fine job at running after, alongside and (rarely) in front of David Tennant down various hospital corridors, which may turn out to be a more important skill than it looks. Tennant looks like the sort of bugger that can run fast so it must be a hell of a hassle trying to keep him and whoever’s running with him in the same frame. Thin as a blinking whippet that lad. Anne Reid is an astonishingly brilliant actress who is clearly having fun here. Or I hope so. I said that about a film once and it turned out the cast were having an awful time and hated every moment of it. But Anne Reid's appearance, like that of Roy Marsden as Mr. Stoker (Dracula reference ahoy!) is one of those where you think...blimey you've got a fantastic actor here. Can't we give them a better part. Or parts. Anyway, I’m quibbling really because both Reid and Marsden do well with the parts they've got. Oh and kudos for whoever thought of the straw. We also meet the 'space rhinos' aka the Judoon. They look great, stomp about impressively but aren't really the villains. It's a nice idea and I like the language. You'd think they'd have a more sophisticated way of marking people than a bloody great marker pen though. Oh, and wouldn't you have thought that knowing they were looking for a Plasmavore they might be aware that she could change to appear human or did the Judoon chief miss a meeting? But I quibble. I enjoyed this, and I'm interested to see how Martha's story develops. I've not said much about her family at this point, although it was nice to see Trevor 'Mindwarp' Laird appear. I always enjoy the rare occasions when an actor who has appeared in Classic Who crops up in New Who. I'll say more about the family as and when they appear.